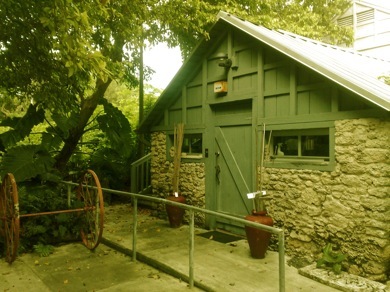 Tucked away at the south end of Coconut Grove is one of Miami’s oldest landmarks, the Kampong. One of its most famous residents, plant explorer Dr. David Fairchild, named the waterfront property after the Malaysian word for village. If you drive by fast enough, you might miss the sign that marks this historic site, in addition to a beautiful, enormous Banyan tree behind the limestone wall off Douglas Road. Behind the green, wrought-iron gate is a lush, tropical orchard and garden that currently serves as the only Congress-chartered National Tropical Botanical Garden in the continental US. (Its four sister gardens are in Hawaii.) True to its mission, the privately funded NTBG advances scientific research, public education and plant conservation. But it’s the history here, as well as the collection of plants, that captivates the imagination. To understand the full range of this property’s history, we need to go back to the 19th century, when Jolly Jack Peacock sold the land to J.W. Ewan (aka “Duke of Dade”) for $50 in 1876. Ewan settled here, planting fruit trees and pineapple. In 1892, Albion R. Simmons and his wife Dr. Eleanor Galt Simmons brought the property from Ewan. Dr. Galt Simmons was the first female physician to work in the area. She built a barn from local limestone and Dade County pine, which still stands on the property. The story goes that she made house calls on a mule and that Miccosukee Indians would camp out on the property to seek treatment. David Fairchild built a second story above Dr. Galt Simmon’s cottage where he wrote many books about his travels as botanist, horticulturalist and plant collector, including the popular work, The World Was My Garden. The study remains just as Fairchild left it, with artifacts from his desk, copious books and framed pictures on the walls. You can see a large Bignay tree from the window that Fairchild must’ve looked out of so many times. He used to make juice from the fruit. 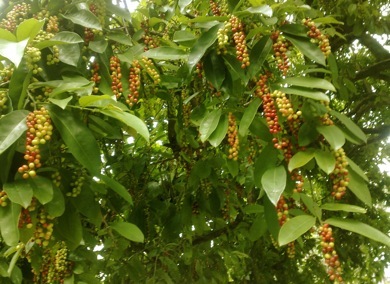 On the day I visited, a few cherry-headed parrots were quietly nibbling away at the abundant berries. In 1928, Edward Clarence Dean designed the main house, relying on an oriental style inspired by Fairchild’s many travels to Southeast Asia. 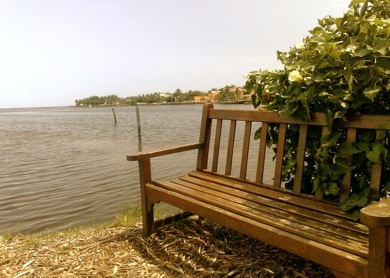 A lawn stretches out to a tennis court and beyond that, a carved-out boat channel extends to Biscayne Bay. But the real stunners on this 11-acre property are the hundreds of trees planted throughout, which include an exotic Buddha’s Hand – a tree that’s sacred in Southeast Asia – as well as an African Baobab. Fairchild’s wife was the daughter of Alexander Graham Bell. Her sister, Elsie, was married to Gilbert Grovesnor, the first editor of National Geographic Magazine, credited with building the publication’s greatness. In 1931, the Grosvenors purchased the property adjacent to the Kampong and called it Hissar, after the small town in Turkey where Grovesnor was born. 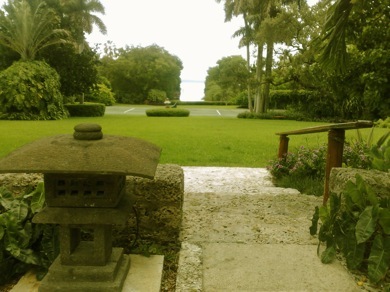 Today, the property is private and boasts one of the oldest standing homes in Miami, which I had the opportunity to see. 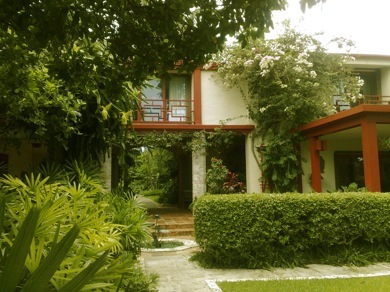 It is beautifully maintained, surrounded by a lawn and mango trees. There are a total of seven historic structures between The Kampong and Hissar properties, five on The Kampong alone. The Kampong was not only the home of two renowned families in the world of invention and exploration, but also the place where Fairchild, Marjory Stoneman Douglas and Ernest Coe conceived the idea of an Everglades National Park. The historic meeting took place in the living room and it’s no small irony—the original, natural landscape here before human intervention was pineland and salt grass marsh fed by fresh water from the Everglades. Many famous people came to the Kampong in Fairchild’s time, include Alexander Graham Bell, Thomas Edison and Henry Ford. In 1963, Mr. and Mrs. Edward Sweeney purchased the property after Marian Fairchild’s passing; she survived her husband David by 8 years. It was Mrs. Sweeney who guarded the Kampong from prospective developers and by 1984, it found a spot on the National Register of Historic Places. That same year, Mrs. Sweeney donated the property along with an endowment. 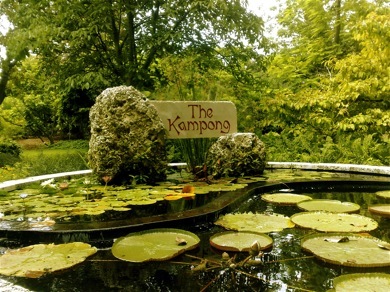 You can take a self-guided tour of The Kampong by calling ahead and making a reservation. Guided and group tours are also available. Visiting hours are 9 am to 2 pm, Monday through Friday. Admission is $10 (adults), $5 (students 7 or older) and free for children under 6 years of age. Call (305) 442-7169 for more information. This Banyan tree at the entrance to the Kampong is about 375 feet (114 meters) in circumference at eye level. 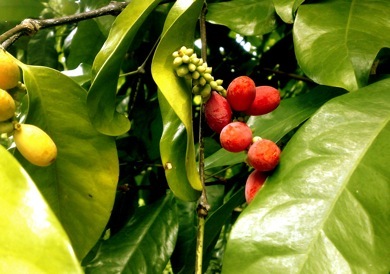 Bignay fruit is native to Southeast Asia. Fairchild developed this variety, which bears his name. Ripe coffee beans in the garden. 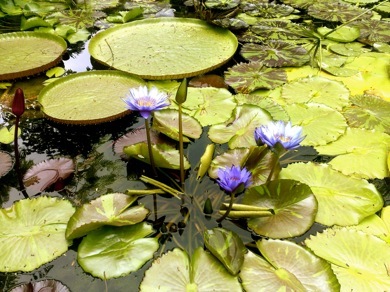 Aquatic plants at The Kampong. 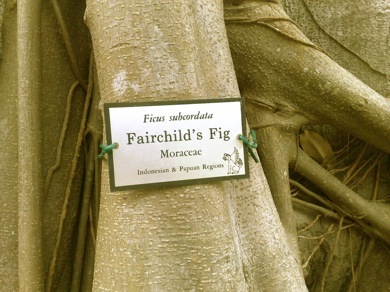 The Ficus tree is considered sacred in the Hindu and Buddhist religions. 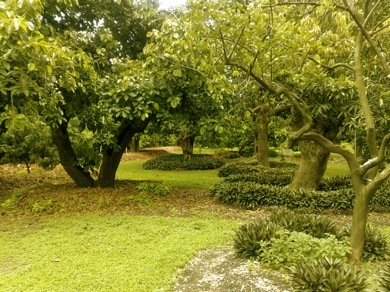 Fruit trees in the orchard. An impressive set of bromeliads. 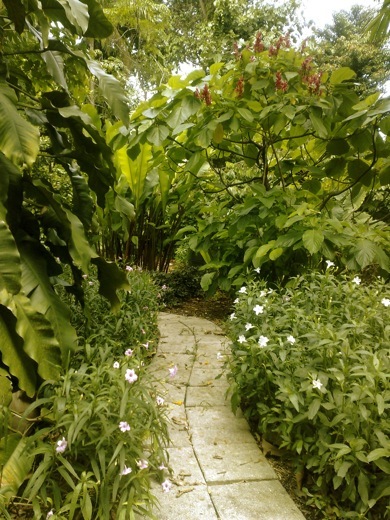 One of several winding paths in the garden. 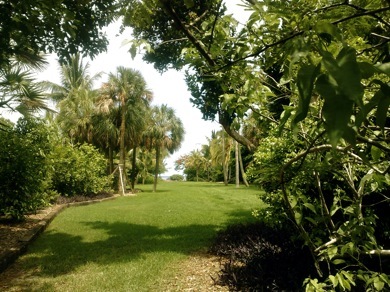 A shaded tree grove and lawn lead to the water’s edge on Biscayne Bay. The area called “The Point” offers a great view of the bay. In the 1890s Dr. Galt Simmons used this barn for her medical practice. Fairchild later built a study above it. 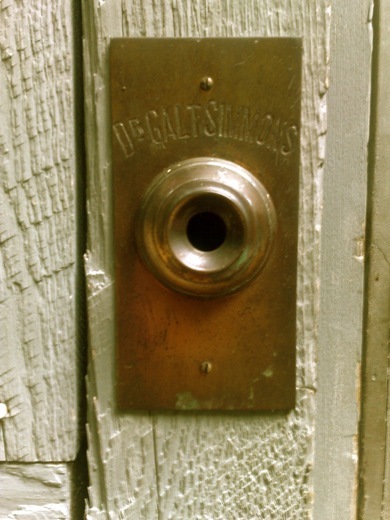 The original doorbell used by Dr. Galt Simmons. 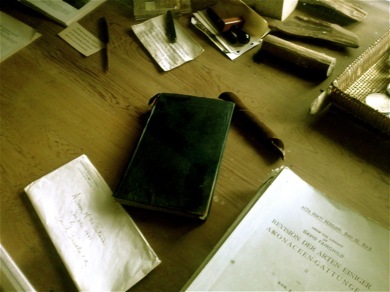 Objects belonging to Fairchild in the study. 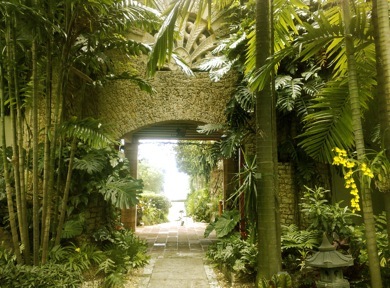 The Main House at The Kampong was designed by Edward Clarence Dean in 1928. 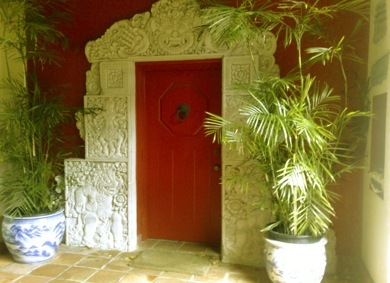 A Balinese soft stone carving adorns one of the doors in the Main House. The view from the Main House. One of several oriental sculptures that adorn the grounds. This one is at the entrance of the Main House. 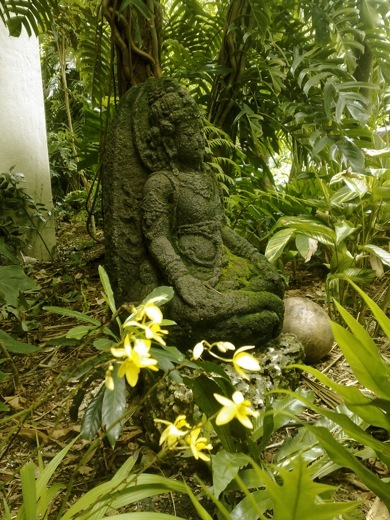 "Touring The Kampong Gardens (Pictures)"
From the pictures this place looks amazing. I pass this area every day and finally i had to catch a glimpse of the name so i could look it up on the web. I would love to bring my kids so we can explore KAMPONG! Hi Lynn, thanks for stopping by here. Yeah, it’s definitely worth checking out. I recommend you contact the garden and arrange a tour. Excellent write, the title attracted me because I spent quite some time in Malaysia and Singapore in the past and am familiar with the term ‘kampong’. 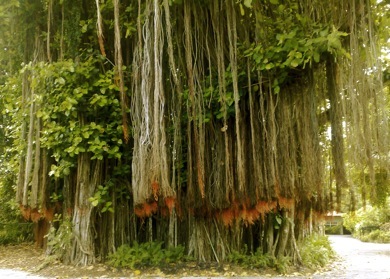 The banyan tree is really one of my favorite trees, its visually so fascinating in the way it grows! Pareidoliac, thanks for stopping by! I’ll have to check out that comic series. It seems really interesting. Yeah, the banyan is a tree hugger’s dream. 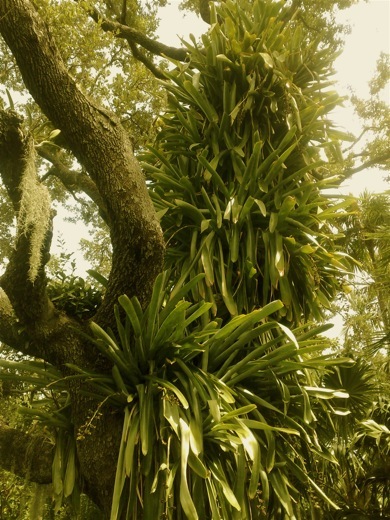 There are many banyans growing in the South Miami area. What a gorgeous and tranquil garden - I’d love to try to recreate some of this in my own home. The Kampong is now accepting volunteers. If interested, please call the number in the article.